Following up on a recent flurry of Apple acquisitions and key hires from the augmented reality/virtual reality field, Piper Jaffray analyst Gene Munster believes the iPhone maker plans to pivot on iOS in a bid for the mixed reality space within the next two years. Munster, in a research note obtained by AppleInsider, notes a basic timeline of recent purchases and hires suggests iOS ecosystem support might be ripe for launch as soon as 2018. A recent spate of acquisitions and hires points to a significant undertaking, with serious assets earmarked specifically for AR/VR research and development. To his point, the analyst said a search on LinkedIn revealed at least 141 Apple employees with a background in AR. Put into perspective, LinkedIn shows 425 people with similar experience working at Microsoft, while 267 are at Google. 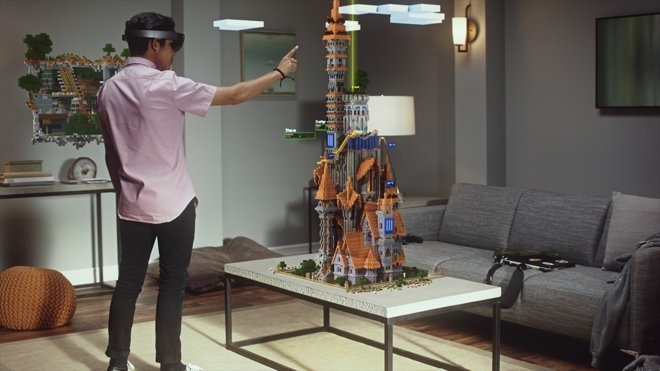 Microsoft is currently moving ahead with its HoloLens project, a Windows-based goggle-type device that shows promise, at least in controlled demonstrations. Incidentally, Apple poached a lead HoloLens audio engineer last August. Of particular interest is so-called mixed reality wearables, or basically advanced optics that use embedded cameras, sensors and other components to meld realistic holographic imagery with real life objects. Apple's existing stash of IP, gained through R&D and strategic acquisitions like 2013's PrimeSense buy, covers early stage computer vision tech capable of processing motion tracking operations and basic relative location calculations. Alongside internal development, and depending on how the field shakes out, Apple could rapidly evolve its program with more acquisitions. Munster throws out a few names in his report, including Magic Leap, Movidius, Occipital and Pelican Imaging. "We believe 10 years from now Generation Z will find reality inefficient," Munster writes. "We believe the concept of an 'inefficient reality' is evident through smartphone use today —the precursor to mixed reality —offering users the ability to find more information as needed." There will be a natural progression from current cutting-edge personal technology —smartphones —to AR/VR devices, which could see mass adoption as wearable devices priced in line with modern handsets. Indeed, Munster believes Apple is currently looking at VR like it does Apple Watch, which is to say a peripheral for iPhone. The analyst does not see the company releasing its own hardware, however, at least not in the near term. Over the next year, third-party firms should continue with experimental AR/VR deployments based on iPhones and iPads, building their own solutions onto the lattice of current resources, the analyst says. By 2018, however, Apple might be ready to offer developers an official framework for sanctioned hardware solutions as part of the MFi program, a move that would take a page out of Samsung's playbook. The Korean tech giant currently fields the smartphone-powered Gear VR platform. There is abundant evidence that Apple is conducting AR/VR systems research behind closed doors, including numerous filed and granted patents covering virtual displays, augmented reality and computer vision. Last year alone the company purchased German AR firm Metaio, real-time motion capture specialist Faceshift and computer vision startup Perceptio. More recently, the head of Stanford's VR lab said visits from Apple researchers are becoming increasingly common. Related to scholarly research, a report in January said Apple snapped up Doug Bowman, a leader in the field of immersive VR. These initial steps are expected to be the first in a path toward phasing out iPhone in favor of a mixed reality headset or similar device. That reality, however, is not expected for at least 15 years, Munster says.